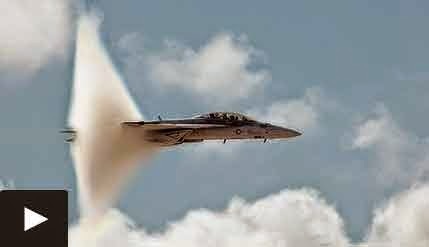 Supersonic speed is a rate of travel of an object that exceeds the speed of sound. For objects traveling in dry air of a temperature of 20 °C (68 °F) at sea level, this speed is approximately 343.2 m/s, 1,125 ft/s, 768 mph, 667 knots, or 1,235 km/h. Speeds greater than five times the speed of sound are often referred to as hypersonic. Supersonic jets and rocket vehicles require several times greater thrust to push through the extra drag experienced within the transonic region (around Mach 0.85–1.2). Following is the crazy video Of Atlas Rocket and numerous jets breaking the sound barrier.